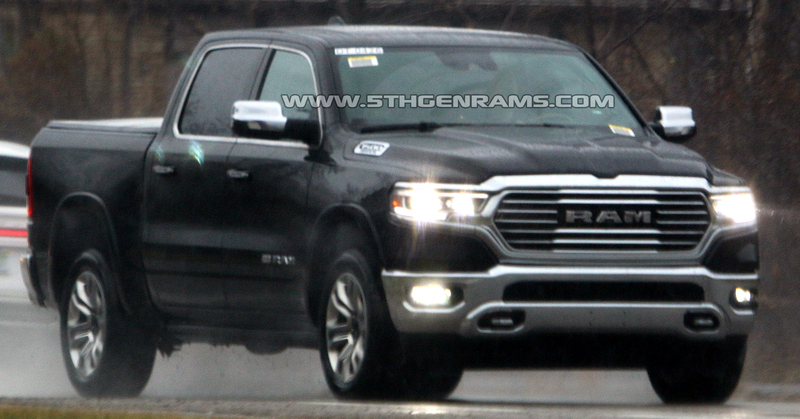 Have caught a bunch of 2019 Ram 1500’s in various trim levels testing on the streets this past week. These 2019 Laramie Longhorn shots are particularly interesting as they show the new grille design off in a different light. Viewed from the front the grille projects a strong 3 dimensional appearance almost almost giving the illusion of a center bar and grille sides sloping away. Bodyside sculpting and the flared fenders are also more visible in these shots than in auto show pictures. Laramie Longhorn shares the Active Bi-LED headlights with the Laramie Limited but has a grille design unique to the Longhorn. We expect 2019 Ram 1500’s to be showing up on dealer lots by March. To learn more about the 2019 Laramie Longhorn click here. To view our newest spy photos of other trims, click here.